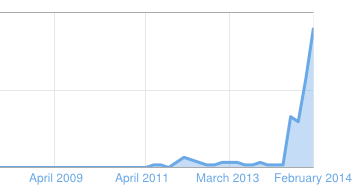 That chart right up top there shows you the pageview growth we here at the Illinois Truth Team have experienced over the past month. Thanks to ALL OF YOU, February 2014 was our 'biggest month' yet in terms of traffic, visitors, time on site, and just about every other meaningful metric when it comes to web traffic. Even with fewer days, we managed to more than double the numbers from January - which was our previous high-traffic mark. We thank all of you for reading, submitting things, and most of all....half-way laughing with us through the entire month. The primary is just a few weeks away and we're going to hit it hard so we hope you'll stay tuned to the Illinois Truth Team and help us tell good stories in Illinois Politics.